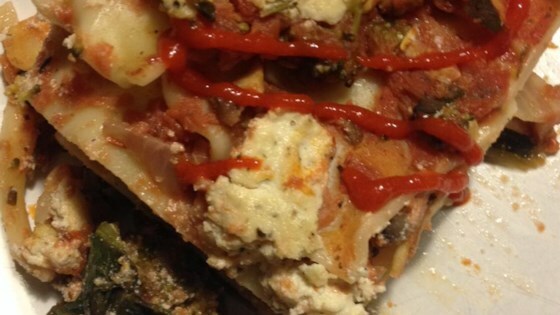 "A delicious alternative to traditional lasagna. Great for a dinner party, even when entertaining non-vegetarians! For vegans omit the cheeses!" Preheat oven to 375 degrees F (190 degrees C). Lightly grease one 9x13 inch baking dish. Place a layer of tomatoes in the bottom of the baking dish, followed by a layer of noodles, spinach, carrots, zucchini, summer squash, eggplant and broccoli. Season to taste with oregano, salt and pepper. Repeat layering of ingredients until all are used up. If using cheeses sprinkle over broccoli layers and on top of dish. Bake at 375 degrees F (190 degrees C) for 25 to 35 minutes. i shredded the veggies and sauted them a bit in some olive oil and garlic, mixed them with some canned chunky tomato sauce and it came out fine. I didn't have room in the pan for all of those vegetables. You'll have to dice finely to pack it in!